In 1903 this old pub was owned by wine and spirit merchant Malcolm McIntyre. He continued to serve the local until after the First World War. 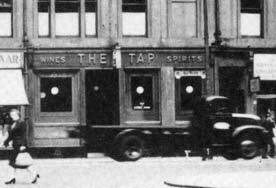 During the 30s Mr J McGowan ran the pub before Eward Hamilton took over. Mr Hamilton ran a successful business here until the pub was closed and demolished in the 1960s. Dinner dance at the Glasgow Vintners' Golf Club. 1957. 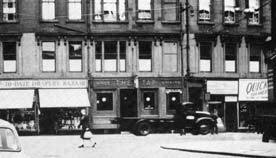 Left to right Mr & Mrs Edward Hamilton, Tap Bar, Argyle Street, Mr & Mrs H McLaughlan, Central Bar, Prestwick, Mr Paul Kearney, Kearney's Bar, Castle Street, Mr & Mrs John Hamilton, The Tavern, Glebe Street.